One of the main reasons I prefer Android over other mobile operating systems is its customizability. I mean, you can configure each and every aspect of Android to make it look and behave exactly the way you want. Probably the best and the simplest way to customize your Android device is by using launchers. 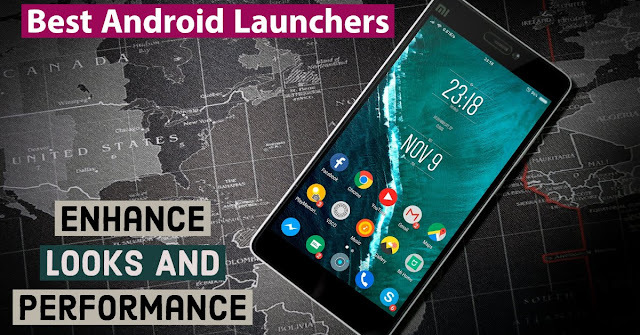 Maybe that’s the reason why Android launchers are the most popular apps on the Play Store but which are the best launchers for Android? 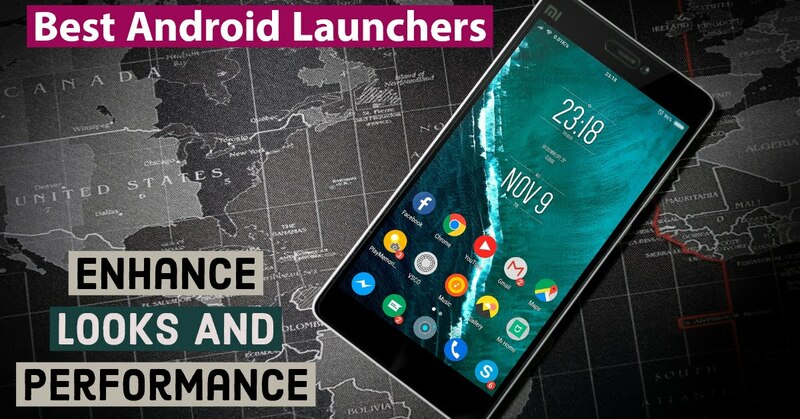 Android smartphones are inoperable without a launcher, which comprises of your home screen and the catalog of all the apps available on your device. So every device comes with a default launcher pre-installed. Smart Launcher is one of the oldest launchers on Android. However, the app faded from the limelight for a couple of years as it was not updated regularly. 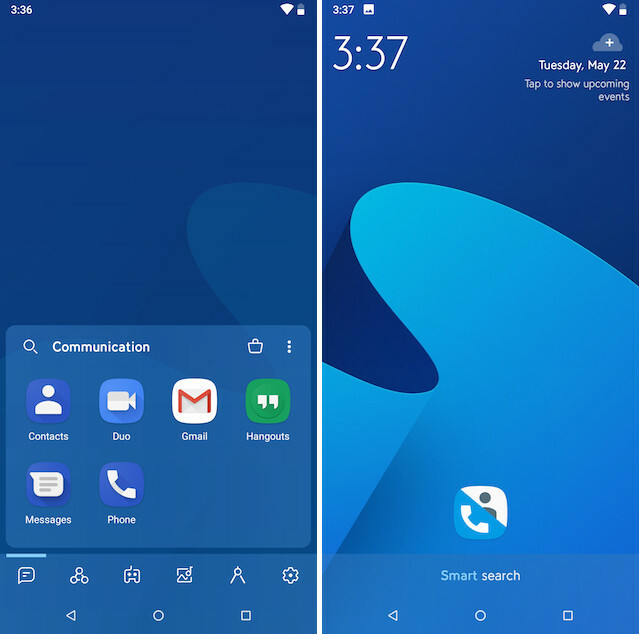 But things have changed now, as the developers came around and launched a brand new version of the launcher called the Smart Launcher 5 and it is really good. The launcher brings many features like the ambient theme, adaptive icons, automatic app sorting, built-in clock and weather widget, and more. There’s also a smart search feature which lets you easily search for apps, contacts, and more. One of the newest feature addition to Smart Launcher is the support for new gestures and hotkeys which makes it really easy to launch apps and navigate the launcher’s interface. Another unique feature of the Smart Launcher 5 is that it allows users to hide apps. So you can easily protect apps that contain sensitive information. Lastly, the launcher also supports theming which means that you can completely change the look of your launcher by choosing and installing from hundreds of pre-built themes. ADW Launcher used to be on this list until the developer stopped supporting. 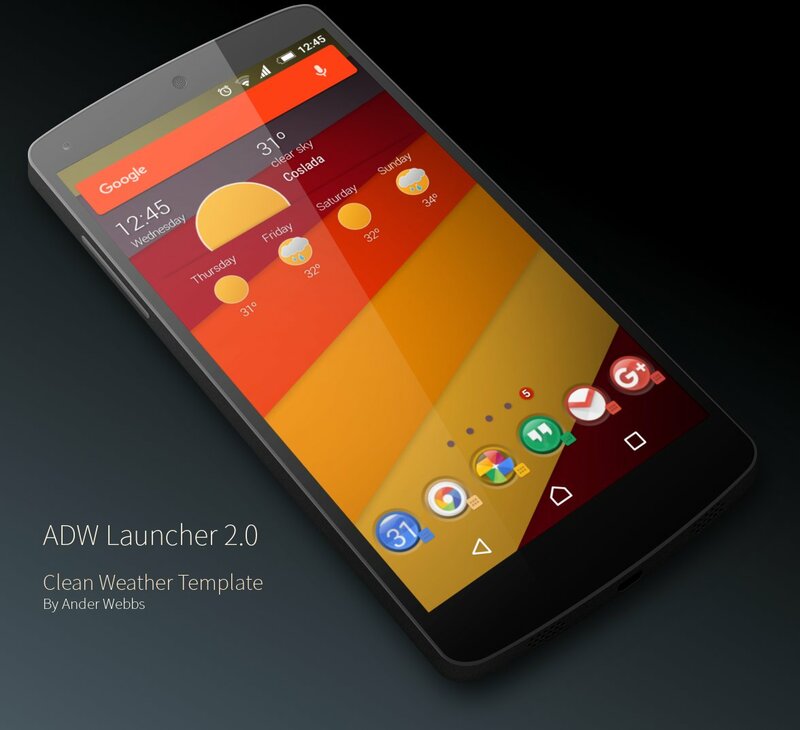 However, with the launch of ADW Launcher 2, it was an obvious choice to add it back to the list. This one includes an updated UI that fits in line better with stock Android. Additionally, there are launcher shortcuts, many customization options, extensions, and tons of other modern features. It also has one of the best make-your-own-widget features that we've seen. It has retaken its rightful place among the Android launcher elite. You can download it for free or pick up the pro version as an in-app purchase for $3.49. EverythingMe neatly organizes your phone and can recommend the best apps for you. Home-screen folders are created category wise during initial setup. It has customizable gestures and a prediction bar for fast app searching. A swipe on your home-screen will take you to “Quick Contacts” where you will find your frequently used contacts. “WeWatch” is another screen where you will find news feeds but it is not much customizable. The launcher gradually learns from your habits and delivers the best it can. 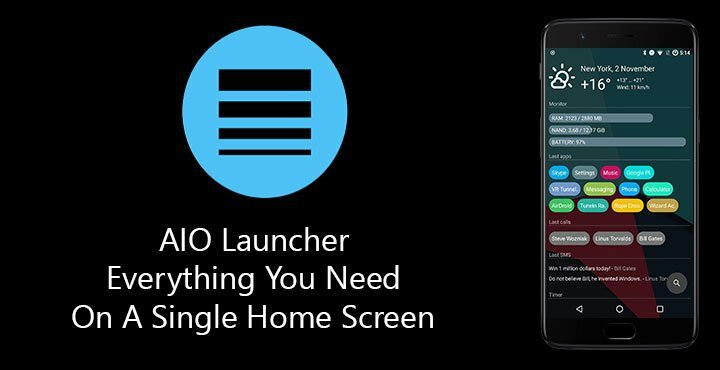 AIO Launcher does it differently than many Android launcher apps. It does away with the standard home screen in favor of an information-packed list of stuff. It shows things like your latest SMS and missed calls, your media player, your system info (RAM, battery, storage, etc), and even stuff like news, Bitcoin price, Twitter, and more. The paid version also includes integration for Telegram and your regular widgets from other apps. Not everything has to look like stock Android and AIO Launcher certainly shows that it can be done effectively. It's free for most features. The full version is a very reasonable $1.99. 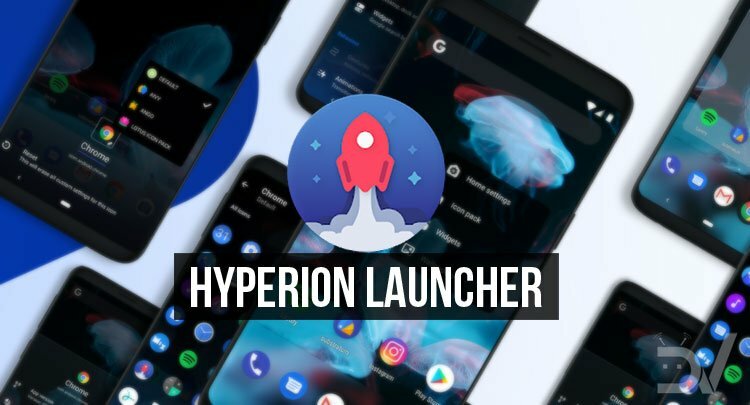 Hyperion Launcher is the new kid on the Android launcher block. It slots in nicely between heavier launchers like Action and Nova and the stock Android experience of Lawnchair. The UI is decidedly stock looking without a ton of bloat or flair. There are plenty of customization features, though. They include third party icon support, an icon shape changer, theming elements, and some other neat stuff. It supports Google Feed, but it requires a separate download just like most other launchers. It's new, but it's already slots in favorably among the best launchers on Android. 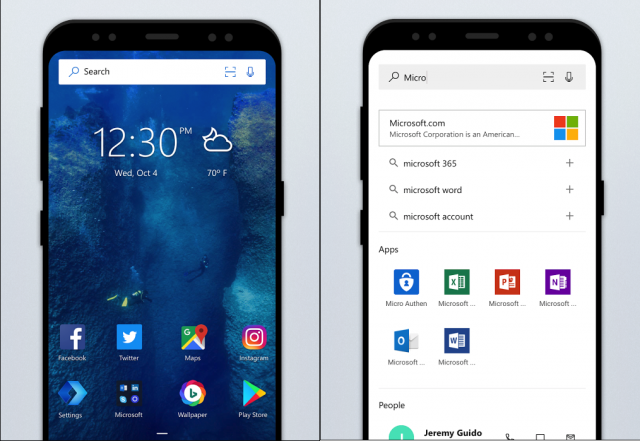 Microsoft Launcher isn't a new launcher. The app used to be Arrow Launcher. Microsoft re-branded the app in mid-2017. The app features integration with many Microsoft services, including their calendar, email, to-do list app, and direct integration with Microsoft PCs. It also has customization features and gesture controls. This one returned to beta after the rebrand. Thus, there are likely some bugs for now. However, it's something different and especially useful for those who want better integration with their Windows PC. Another free launcher that brings the stock Android look and feel is the Rootless Pixel Launcher which has become really popular in the last few months. One of the best things about this launcher is that it is regularly updated to bring bug fixes and new features. Also, the devs were kind enough to develop the Android Go version of the Rootless Pixel Launcher which is a good news for anyone who is using a budget Android device which doesn’t bring top of the line hardware specs. The only thing to note here is that the launcher is not present on Play Store and you will have to download and install its APK from Github.